Be up on deck when you approach the city: domes and minarets make the skyline one of the most memorable sights of the world. If your ship does an overnight here, a starboard balcony stateroom will offer you an outstanding view towards Sultanahmet, the area where all (or most) highlights are situated. Cruise ships dock at the northern end of the Galata Bridge at Karakoy. The present passenger terminal has not much to offer, even the tax free store is now closed. Taking the tram to Sultanahmet is your best way of transportation, approximate every 5 minutes. Buy red tokens from the vending machines, only 3 Lira (Turkish coins and small bills accepted). The tram stop is only a few blocks from the terminal. A taxi to Sultanahmet Square where most highlights are just takes 10 minutes, from where on most sights are within walking distance. Ask a tour desk representative in the cruise hall what a fair price is before talking with any taxi drivers and agree on the fare. Taxi drivers will ignore the meter. You can walk to the Galata bridge, a 10 minute pleasant walk. Turn left from the cruise terminal and turn left again towards the board walk. From the Galata bridge it is a slightly uphill walk to Sultanahmet. The Galata bridge has to levels: The lower level filled with restaurants and top level for traffic. While the lower level has more ambiance, you will have to negotiate a few flights of stairs in the middle, therefore not recommended for the less able. From the Ataturk Airport: yellow colored taxis will bring you to your ship; there are also express buses and airport shuttles to Taksim. The trip in the direction of the airport can often involve heavy traffic, especially during rush hour. It is always helpful to check the traffic conditions before setting out to the airport. If you take the coast road connecting Aksaray and Bakirköy to the airport, you are likely to experience less traffic. The new five-berth cruise port at Istanbul is in the planning for March 2020. It will be part of waterfront complex of marina, hotels and shops about four miles away from the Golden Horn. The new terminal is designed under the ground with a project to be implemented for the first time in the world. 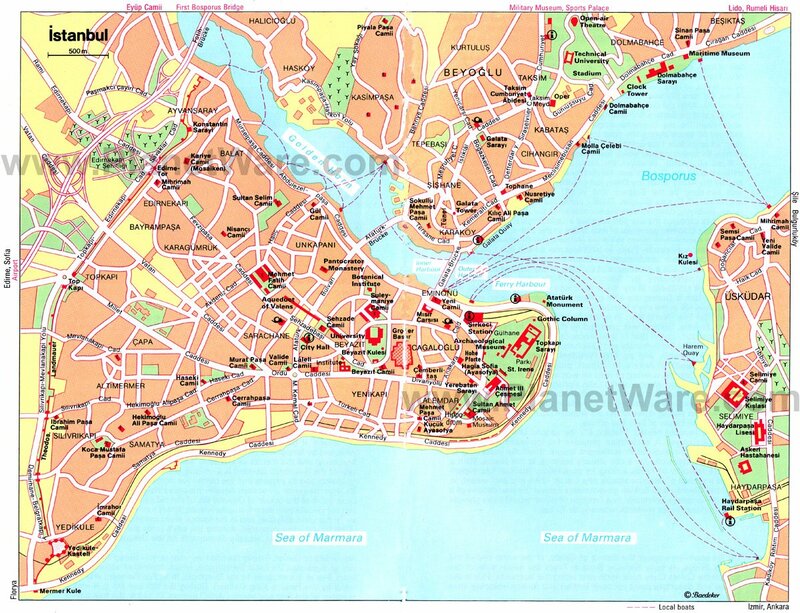 Your ship will arrive in the European (north) part of Istanbul. The Galata bridge spans the Golden Horn which divides the city in the more modern Galata area and old Sultanahmet, where all the sights are. If you are limited in time put Old Sultanahmet at the top of your list. Head for the Sultanahmet Square (Also the name of the tram stop)where you will find: the Topkapi Palace (Closed Tuesdays), the Aya Sophia (closed Mondays), the Blue Mosque (no admission during praying times), the Archaeological Museum and the Hippodrome, all within walking distance of each other. Get there early and spend there the whole day. As you rest on the European shore of the Bosporus at sunset and look at the golden evening light reflected on the windows of the houses on the Asian shore, or as you stand on the Asian shore and watch the sun setting behind the elegant minarets of old Istanbul, you immediately appreciate, why so many centuries ago, people chose to settle on this extraordinary spot. Indeed there will be times you feel Istanbul is really one of the most glorious cities in the world. If you have seen Sultanahmet, venture out to the Asian side of town, with one of the many ferries (3 Lira each way) and enjoy Turkish life in a less touristy way, but as rewarding. Istanbul City Hop-on Hop-off Tour. Only recommended if you want to venture further out, otherwise the tram is your best bet: faster and cheaper. Most ferries leave at both sides of the Galata bridge, the bridge which connects new Istanbul and Sultanahmet. Without a doubt, Istanbul's city ferries offer the easiest, most affordable, and most enjoyable way of traveling between the city's two sides. For longer trips, the sea buses offer quicker service. Some tour companies also operate cruises on the Bospurus, leaving from Sultanamet and also about 400 meters up from the cruise terminal. In town, a taxi is cheap, and the fares are regulated. They are yellow and easy to find. For long journeys, however, drivers can charge more than the meter reads. So negotiate the fare in advance. Traffic can be horrendous, so make sure you do not "miss the boat"
The main shopping center is the Grand Bazaar (closed Sundays), Take the tram to Beyazit, which will save you an rather uphill walk. More than 3000 merchants are waiting for you. You will also like the Spice Bazaar (near the waterfront, down from the Grand Bazaar): visiting the Misir Çarsisi, is not merely a way to fulfill the tourist's urge for the exotic. It is also a chance to really see and live Istanbul's traditional commercial life. The area around the Sultanahmet Square has lots of restaurants and coffee houses. Look for restaurants which have a fixed menu board outside. Restaurants near the tram stops with over eagerly staff are often a rip-off, often having menus with "different" pricing: one to lure in the customers, one to help make up the bill. Often they also will add a "service charge". Examine your bill closely and do not be afraid to contest the bill. Restaurants close to a mosque are not allowed to serve alcoholic beverages, all others will. Tea gardens (kahve) are among the indispensable pleasures of summer nights. It is really enjoyable to sip your tea or cool yourself down while overlooking a stunning sea panorama. Turkey's currency is the Turkish Lira. Public transportation and most museums only accept Turkish Lira. Most shops and restaurants accept Euro and sometimes US$. Always make sure you receive correct change. With a credit or debit card you can withdraw local currency from cash machines which are found in convenient locations and right outside the cruise terminal. Free wireless connections are available at many hotels and restaurants/cafes. Not always advertised, but just ask.